Alberta Stojkovic | Morrow County Sentinel Library Directors from the four Morrow County Libraries spoke at the June Chamber of Commerce Meeting. L-R: Mike Kirk for Mount Gilead Public Library, Sharon Baker of Perry Cook Library in Johnsville, Lisa Murray, who is Cardington Public Library Director, and Suzi Lyle of Chesterville’s Selover Library. 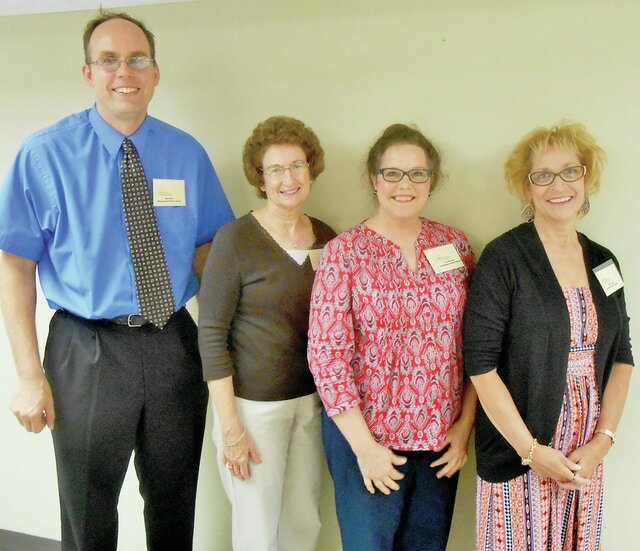 Library Directors from all four Morrow County Public Libraries spoke at the June 16 meeting of the Morrow County Chamber of Commerce. Suzi Lyle of Chesterville’s Selover Library opened the program, commenting that change is definitely happening in Ohio Public Libraries. Some of the primary changes have been in offering a wide variety of services and technology for patrons. Some libraries are providing job training classes, computer classes and classes for GED exam preparation. All Morrow County libraries have Internet and computers available for those who may not have access at home. Lyle said that E books are wonderful resources that can be accessed at home or outside the library – and they, like “physical books” are free. All the county libraries offer traditional children’s story hours and reading book clubs as well. Lyle highlighted Selover’s unique “Pants-A-Palooza” where community residents bring pants, jeans, shorts and skirts to the library for area people to trade and choose at the annual Pants-A-Palooza July 15th. Another Selover program she mentioned is the Mobile Technology Training Bus coming July 23. Community residents can take classes there in Windows 8.1, Cloud Computing and Troubleshooting mobile devices. Cardington Library Director, Lisa Murray emphasized that the Cardington Library caters to all ages, interests and income levels. Their staff works on teaching basic skills in using the library and Cardington teachers often identify materials and books for the library. This way, children can get maximum benefit from the library’s resources. Cardington Library’s Computer Class topics reflect many interests from “Setting up an Etsy account,” to Using Web MD. Other Computer class topics in Cardington are Viruses and Malware, Alternatives to TV, Photography Series 1, 2 & 3, Word press 101, Amazon, Homeschooling Computer, Power point, and Microsoft Access. Murray spoke about the library being both a safe haven for children and a social gathering place for the community. She said book loans are still a major service for their patrons along with helping aging with technology challenges and fostering hope for employment by giving library services to the unemployed. Mount Gilead’s Public Library Director, Mike Kirk spoke about the value of partnering for the Mount Gilead Library. They partner with Marion Tech’s ABLE program for those preparing for the GED exam. They also partner with the village pre-schools and elementary schools to provide reading and story programs. The Mount Gilead Public Library has partnered with the Morrow County Historical Society by housing many genealogy materials in the Library Annex. They also house the county newspapers back to the 1860’s on microfilm. Johnsville’s Perry Cook Library Director, Sharon Baker has been working there since 1986. She has seen it change from a women and children’s library to a full service library with a wide range of resources. It is also a valuable community resource with a large meeting room where classes and exercise programs are held. Lately they have had an on-site tech person one night a week to help people who have problems with their tech devices. A few years ago Perry Cook was an inoculation site that was used by the Health Dept. to inoculate many including 200 Amish. Since there is a large Amish population in Johnsville the Amish often use services such as fax and computers. Some use the computers themselves, but often they ask staff to get information for them. They also charge their cell phones at the library.